I had a baking frenzy last week. Not only did I bake 3 pies and pumpkin bread (and even a pumpkin challah!) for Thanksgiving dinner, two days later we held an engagement party for my older daughter and future son-in-law for our family in California. We expected about 50 people, and while I was going to buy the appetizers (thanks, Costco! ), I wanted to make the desserts. All of them. Six different dishes, to be exact, including a pie with a lattice pie crust (something I’d always wanted to learn). 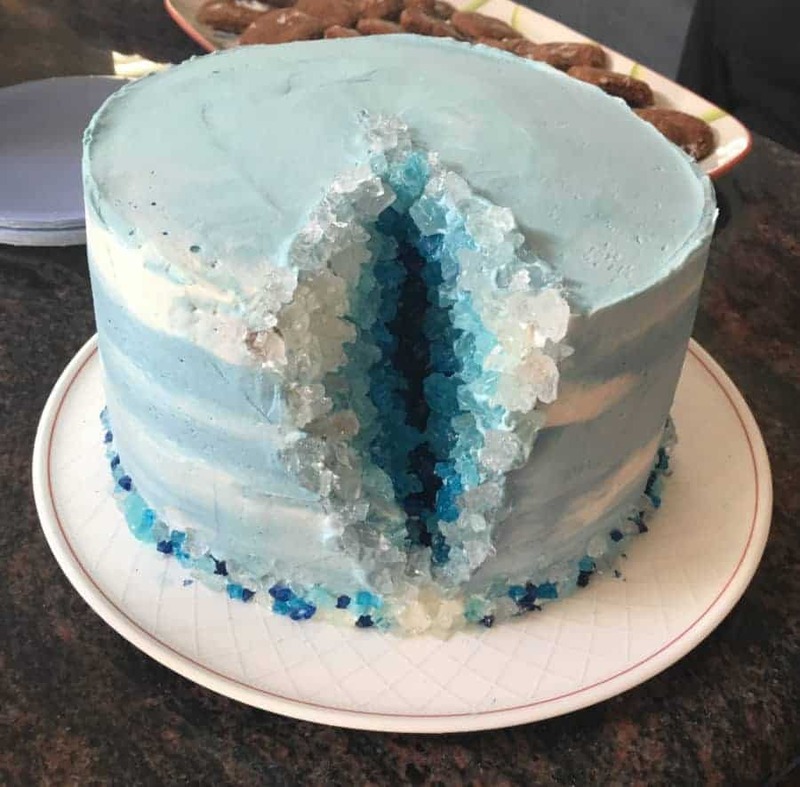 Plus, my younger daughter wanted to make a Geode Cake for her sister and future brother-in-law, so I baked 4 cake layers. Needless to say (although I am saying it), advance planning was critical. Many thanks go to my patient and wonderful mother-in-law for her ingredient- and equipment-gathering prowess, as well as her tolerating the invasion of her kitchen. While several of the items I baked were tried and true annual favorites, I chose some new recipes as well. One of these was a Cranberry Almond Apple Pie pie from Sally’s Baking Addiction. The filling was straightforward enough (sliced apples and fresh cranberries), and the addition of almond paste at the bottom of the crust (before adding in the filling) made this pie stand out. Also, it had a lattice pie crust, a technique that had always awed and intimidated me. It just looks so hard! But I wanted these pies to look as special as they were going to taste (it’s for a party, after all), so…challenge accepted! Sally’s recipe gave pretty good instructions on how to weave a lattice pie crust, but another of her posts gave more complete instructions, plus design ideas and even YouTube tutorial from Saveur magazine . The ball, as they say, was in my court (the ball of dough, that is). Roll out the dough for your top crust to about a 12" circle (less than 1/4" thick). Cut out strips of desired widths from your rolled out pie crust. You'll need about 10-12 for a standard 9" pie. Starting in the middle, transfer every other strip of dough and lay them parallel to each other on top of your filling, at whatever spacing you want. Turn back every other strip of dough a little more than halfway, then take the longest strip left of the ones you cut out and lay it perpendicularly across the top of the pie on the strips not turned back. Straighten out the turned-back strips and turn back strips you didn't touch the first time. Lay the next smallest piece of rolled out strip next to the first perpendicular piece. Repeat alternating turning-back the parallel strips to finish the current side, then turn the pie around and repeat the process for the other side. Once the strips are woven, crimp the edge of the lower crust onto the ends of the strips to seal them. Brush the top of the lattice with an egg wash to get that golden color pies deserve. Easy Peasy? No, I agree…reading the instructions confused me, too, so here is the Saveur’s demonstration on YouTube. Much clearer, right? Seeing is believing. You can cut shapes with the leftover crust dough to decorate the top of the lattice (and hide any breakage). Just lay the shapes on the egg wash-glazed lattice and glaze the shapes as well (they deserve golden lovin’, too!). I’m really excited at the prospect of creating various lattice designs, so I think Apple pie, Chicken Pot pie, or even Moroccan Beef pie will be on the menu in the near future. I really don’t think my family (or co-workers) will much mind. Let the baking frenzy (re)begin!